Almost every business leader will say that people are their most important asset, but few do anything about it. If you are going to take this principle seriously then human capital planning is crucial. The Human Capital Plan is an important tool that organizations use to drive focused actions that can ensure goal achievement and business success. It allows organizations to assess, plan for, and respond proactively to its human capital challenges and needs. It helps shape the organization by building a plan to develop the workforce and practices neededto meet an organization's vision, mission, and goals. 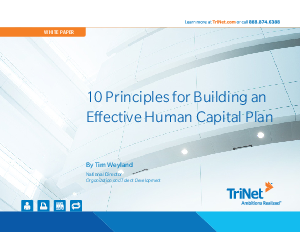 Read on to learn about 10 principles to follow in order to build an effective human capital plan for your organization.